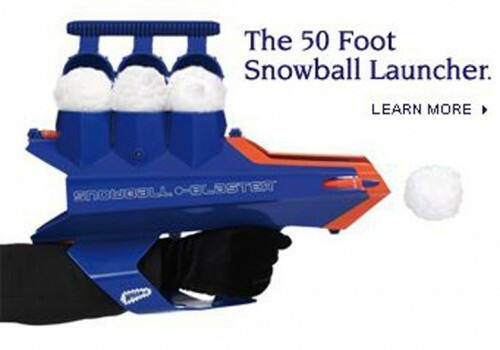 The 50 Foot Snowball Launcher. Do Want! But I may need some snow first. Wham O makes great stuff. Damn, sometimes I really hate living in Houston, Air Conditioning capital of the world. eh you don’t need snow…you can load it up with asbestos fiber and have yourself a cancerific time. lol at first i thought it made 50 foot snowballs and umm only giants could use it…. I will take on anyone armed with one of these in a snowball fight. Heck, I’ll leet you have 2 of thm. You won’t stand a chance, even inside 50 feet. I have to have one of these! Just like I have to have one of those snow skate things. Broken. I clicked it but didn’t learn more. I love Think Geek, Hammacher Schlemmer too. 50′??? Can’t most of us throw at least twice that far?